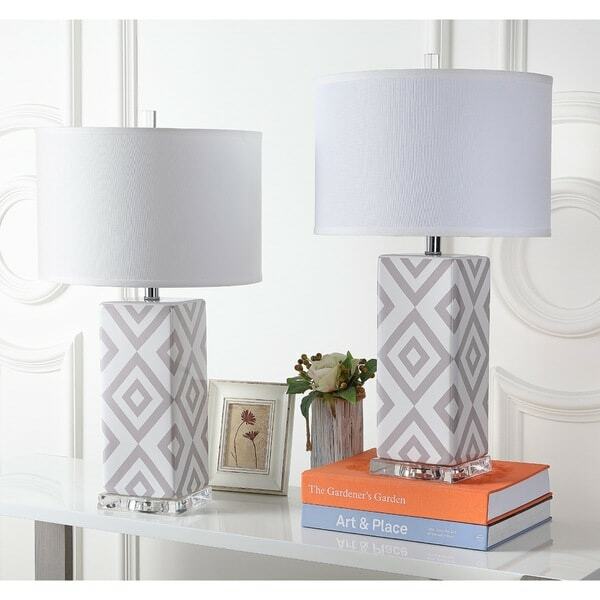 Fresh and graphic, the Diamonds table lamp by Safavieh brings a welcome pop of color to transitional rooms. Crafted of grey and white ceramic with acrylic base and a silver neck, this concentric diamond motif is topped with a crisp white cotton shade. Dimensions 27 in. H. x 15 in. W. x 15 in D.
We have had these for two years, and still really like them. They look great, have good light. One shade arrived slightly damaged, but overstock was great. I accepted a account credit, since the damage was slight and I could turn the shade towards the wall. People comment how much they like these, including my decorator! They are nice but I feel very overpriced - I rushed to order them and I am not good with returns. The lamp shade is very close to the base so the light doesn't really reflect as much as I would have liked. Wish the shade was 4-5 away from the base. I would have given them a five except that one lamp has a nick. Not a very big blemish, but it dropped them down to four stars because of it. They fit very nicely with the new bedroom decor. Too heavy to send back for a minor blemish, so I will fix it with some white out. Thank goodness it's not on the gray! These lamps are nice and have a lot of potential. I think the price is what got me the most! They were a good buy just need the perfect place to put with out many colors in the room. These lamps are great quality and look chic and modern. They look far more expensive than they are! We bought two! The look is so diverse and funky at the same time. It has added so much character to our home. 5 stars all the way! We are beyond happy. Loved these lamps so much, I purchased for both my teenage daughter as well as my vacation home by the beach. Very on trend, and looks great with any decor. "What is the dimensions of the base of the lamp?" 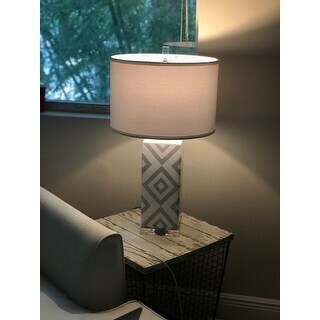 Hello Naefter, the base of the lamp is approximately 5.5 inches W x 5.5 inches D x 13.25 inches H. Thanks for shopping with us! Love the design and two at this price is a good deal. 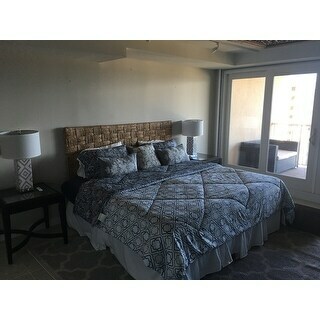 Will coordinate nicely with my newly redecorated master bedroom! Properly placed lamps can enhance your decor and set the mood in your home. Keep reading to get some tips on how to use your lamps to create a comfortable and inviting space.